Traditional grinding stone used for making chutney, dosa batter and idli batter, in India today. In archaeology, ground stone is a category of stone tool formed by the grinding of a coarse-grained tool stone, either purposely or incidentally. Ground stone tools are usually made of basalt, rhyolite, granite, or other cryptocrystalline and igneous stones whose coarse structure makes them ideal for grinding other materials, including plants and other stones. The adoption of ground stone technology is associated closely with the Neolithic, also called the New Stone Age. The Stone Age comes from the three-age system developed by Christian Jürgensen Thomsen. In the Levant ground stones appear in Mesolithic 2 (Natufian). In prehistoric Japan, ground stone tools appear during the Japanese Paleolithic, possibly predating adoption elsewhere in the Neolithic by 25,000 years. Ground stones were created and used for a wide variety of reasons. Each use resulted in a different development and process by which a person created their ground stone. For example, the process for creating the head of a hammer is different from the process used to create a detailed decoration piece for one’s home. That being said, there are some processes that are basic to most ground stone making. When choosing what type of stone to use for a ground stone tool, toughness is the most important factor. If the stone is not tough enough to withstand hard hits and instead just flakes and cracks easily, the work done to create the tool has gone to waste. A stone that will not shear, flake, or crack when tested against large impacts is the most important aspect when choosing what kind of stone to use. Examples of this kind of stone include limestone, sandstone, granite, basalt, rhyolite and other igneous and cryptocrystalline rocks. Cryptocrystalline rocks are good to use for ground stones because they have a very fine grain structure. This is helpful because the smaller the grains are in a rock, the harder the rock is. Holes could be ground out of stones with the use of sharp pointed stones or hardened sticks. By spinning the ground stone with one's hands and applying substantial pressure to the sharp point into the ground stone, a hole could be drilled into the stone with a large amount of time and effort. Sand would be used to help quicken the process by putting it in the partially formed hole as the sharp point was being pressed. The sand would help grind more of the stone away. To put a hole all the way through a piece of stone, it would be first drilled half way in one direction and be finished on the opposite side. Some ground stone tools are incidental, caused by use with other tools: manos, for example, are hand stones used in conjunction with metates and other grinding slabs (querns), and develop their ground surfaces through wear. Other ground stone tools include adzes, celts, and axes, which are manufactured using a labor-intensive, time-consuming method of repeated grinding against a harder stone or with sand, often using water as a lubricant. These tools are often made using durable finer-grained materials rather than coarse materials. In the North American arctic, tools made of ground slate were used by the Norton, Dorset, and Thule tool cultures, among others. Common forms of these tools were projectile points and ulus. 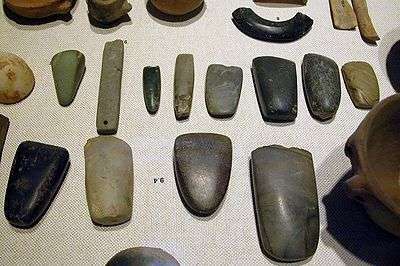 These tools were often purpose-made by creating a blank, either by chipping or using a technique where the slate was was sawed partway through on one or both sides and then snapped into a blank, then finished by grinding with abraders or whetstones. When making the head of an axe out of stone, the piece would be made so it could be hafted. In order to have the stone hafted onto a larger piece, like wood or bone, the ground stone may have at least two notches ground out of one side of the stone, making grooves for the hafting material to lie inside. These grooves would ensure that the stone would not move when struck with a large force. Tough hide would then be wound around the handle and inside the grooves, binding the ground stone and the handle together. 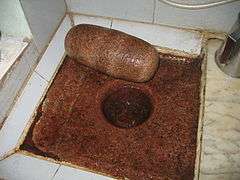 Ground stones were often used as dinner wear. Using large stones, lithic reduction would be done for long periods of time to create bowls and pots for food. Jewelry, beads, ear spools and other decorative ground stones were a sign of high status due to the time and effort needed to make pieces of such small size and detail. When mashing up seeds and leaves into powders, rounded and smooth ground stones would be used inside a stone bowl. This pair of tools is called a mortar and pestle. The material would be placed into the mortar and the pestle would be moved and pressed into the mortar to grind the material into a fine powder. This process could be used for medicine and cooking. Mortar and pestle is still used today for many cooking recipes. ↑ Clark, Donald W. (1982). "An Example of Technological Change in Prehistory: The Origin of a Regional Ground Slate Industry in South-Central Coastal Alaska". Arctic Anthropology. 19 (1): 103–125. Banning, Edward Bruce. The archaeologist's laboratory: the analysis of archaeological data. Kluwer Academic/Plenum Publishers, New York. 2000, p. 151. Bender, Tricia R. "Ground Stone Artifacts: Series in Ancient Technologies: The Office of the State Archaeologist at The University of Iowa since 1959." Ground Stone Artifacts: Series in Ancient Technologies: The Office of the State Archaeologist at The University of Iowa since 1959. N.p., n.d. Web. 17 Nov. 2013. <http://www.uiowa.edu/~osa/learn/ancient/groundstone.html>. Fagan, Brian. Ancient North America. Thames & Hudson, London. 2005, p. 191-99. Moore, D.T., 1983, Petrological aspects of some sharpening stones, touchstones, and milling stones. In The Petrology of Archaeological Artefaces. Clarendon Press, Oxford. "Native Americans:Historic:The Illinois:Technology:Tools:Ground Stone." Native Americans:Historic:The Illinois:Technology:Tools:Ground Stone. N.p., n.d. Web. 18 Nov. 2013. <http://www.museum.state.il.us/muslink/nat_amer/post/htmls/te_ground.html>. Sepp, Siim. "Conchoidal Fracture." Sandatlas. N.p., n.d. Web. 18 Nov. 2013. <http://www.sandatlas.org/2013/03/conchoidal-fracture/>. Wright, Katherine. "Craft Production and the Organization of Ground Stone Technologies." London's Global University. N.p., n.d. Web. 18 Nov. 2013.